Your kiosk software, digital sign software, web site and mobile apps are now all manageable with Livewire Digital’s omni-channel customer engagement software. That means you’re empowered with real-time management of your various digital touch points for CRM, social media and cloud devices and services. 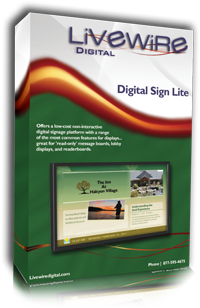 Our User-friendly software allows you to manage all of your mobile, digital sign, and kiosk devices from a single source using our user-friendly eConcierge® Customer Engagement Platform. Livewire offers one of the most comprehensive multi-channel customer engagement suite of software products to connect you with your customers. Our software provides a wide range of features from security and lock-down of the operating system to remote monitoring and reporting, while offering extensive flexibility in managing deployment of content to all of your devices. We have a product to meet your needs. Get started quickly with our hosted software, relieving you of the effort to maintain servers, at a low annual cost with no long-term commitments. Our licensed offerings are great for businesses with an IT staff able to manage a large network of kiosks and digital signs. Browse our products below or use see our Product Comparison chart to determine the best fit for your need, then contact us for a live demo of our capabilities. 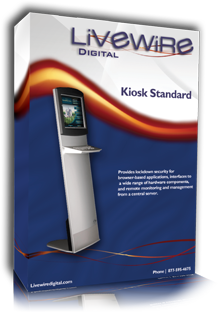 Kiosk Standard provides lockdown security for browser-based applications, interfaces to a wide range of hardware components, and remote monitoring and management from a central server. 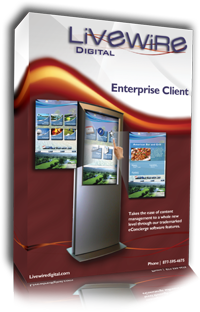 Our Enterprise Edition of kiosk software with integrated digital signage software takes the ease of content management to a whole new level through our trademarked eConcierge software features. 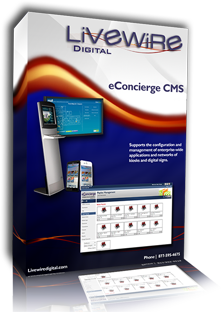 LIVEWIRE’S eConcierge CMS Enterprise Server software platform provides end-to-end integration for your kiosk and digital signage software solutions.